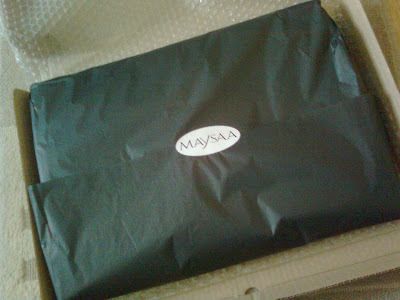 Maysaa products arrived very nicely packaged, and more importantly, an order receipt and returns slip is also included. Hijab Style loves professionalism! When I first took the trousers out of their packing, the first thing I noticed is the stunning fabric. It's lightweight, soft and silky with a subtle shine, and is cool to the touch - perfect for summer! The trousers are also fully lined, so no need to worry about being see-through either. Other features include two side pockets, two front pleats, and a discreet zip and hook and eye fastening in the centre back. I ordered my usual high street trouser size, which I found to be a good fit around the waist (none of the gaping you get with most trousers!). However the fit around the hips was problematic. The pockets tend to balloon out, and the front pleats only serve to make your midsection look larger. Combined with the extra-wide cut of the trouser legs, I didn't find them to be the most flattering fit for my shape; I felt they were designed with a very slim figure in mind. As you can see from the photo above, the trousers are also quite long, so if you're short they'll need to be hemmed up. On the website, the trousers are shown worn with a fitted long sleeve top. Considering the slinky nature of the fabric, I am personally not comfortable wearing them without a longer top. However with such a wide leg fit, that's pretty difficult to pull off without ending up looking huge, especially if you're not particularly tall! I love the fabric and colour of the trousers; they're perfect for taking on holiday and wearing either with neutrals or richer jewel tones. I'd love to see a few alterations such as a wider waistband for a better fit around the top, and a slightly narrower leg so they can be worn with longer tops. What a lovely review. Thanks Jana, it's good to hear product reviews and I can relate to you with this trouser style. U were right about the fit of it! It didn't look so flattering on U. This fit is great for a very thin muhajjaba who wants to look a little bigger. I also noticed that the sew on the sides was not so correct. Great review! Keep up the good work dear, U're an inspiration! I agree that the packaging is very professional. It felt good unwrapping. I get what you mean by the pants not being a perfect fit for curvier ladies but I think you can try using less contrast with the colours, to give the illusion of height. :) Also, the way you stand makes a difference too, if it makes any sense. I find that standing with your feet apart like the 2nd picture makes one look shorter/frumpier. To add on to your review, I've got Maysaa's batwing long sleeves and have to say that the top is marvellous. :) I think that that top should fit curvier ladies, because it is a relaxed fit, and there is an adjustable ribbon around the hip area. Plus, I like that even though it's white, it's not translucent (unless you wear a shocking pink bra, I guess!). The hijab (with the hood) is also very cool, but I've not worn it out yet because my short hair is likely to come out at the sides/neck area. Lol. I can probably wear it in a few months. thanks for the review... what's up with the stitching down the length of the leg? looks poorly done. Thanks for the review! I loved those pants on the website but was worried about the pleats not looking as great on me as they do on the model and seems that's the case! I think if you tried wearing the pants with your top tucked into it (like the model has done) and then wear the long cardigan over that if you think you need to cover your backside, it should look more slimming and neater this way. Thats how i wear my wide leg pants (not these ones, but generally), but i dont wear a long cardi but thats because i dont think its necessary unless im going to be doing a lot of bending (with 2 babies that tends to happen). While I adore several of the items in the Maysaa store, I really believe that their line and sizing options needs to be expanded! I realize the woman who runs it is stick thin and I also know that the designs are based off of whats trendy on the catwalks (i.e. high fashion)...but, lets be realistic. The vast majority of women are not going to be stick thin with a models figure. The lack of real sizing options is definitely going to put off a LOT of potential purchasers-such as myself. It is indeed possible to make high-street style fashions for women who are not stick thin like a supermodel. I adore those pants btw, they would look superb at work...only, I'm shaped like you and as a general rule I stay away from pleating in the hip/stomach/behind area as it accentuates what I dont want to accentuate. I do hope that over time, as Maysaa matures the sizing will be worked on and the lines expanded to be more accepting of figures which are not super-model thin. Also, as others mentioned, the tailoring on the sides is wonky, they are a new company...so I can forgive them of that, but they also need to address tailoring issues. I LOVE Hijab Style! I just can't get enough of your amazing posts and outfits! What Umm Ibrahim said. I think Maysaa is a very promising company. I do love the clean lines, neutral colors and contemporary designs. I love to see modest clothing that blends well in a Western society. But there is still some room for improvement. I know from experience that it is easy to design patterns that flatter one's own shape and body type, and unfortunately (for me) it looks like Hana has started with designs that look great on slim and petite women like herself. As a result, the designs are problematic for curvier women. For instance, I could never rock a skirt made of thin jersey. It would inevitably look immodest on me. And those pants- well, they will soften and balance a naturally thin figure, but my hip area does not need extra volume or highlighting. It needs to be covered. I, too, am looking forward that inshallah, Maysaa will start providing clothing suitable for different sizes and body types. Especially for those of us on plus size side there are really not that many stylish options to choose from. Thnx Jana for the review. I too have the trousers I got it when Maysaa did their preorders. I'm a little curvy and definitely not slim and I love the fit! I got it in size 14 UK. I think compared to other stores it understands the woman and is modest. Its a tricky balance, but I think this one is one to look out for. It took me a while to choose the size, but I I just looked at their size chart. I was amazed by the quality. Umm Ibrahim mentioned the side part looks wonky and bad tailoring, but I disagree. Sorry...x I think you need to see for yourself, cos the pic doesn't do justice. Not a big fan of the pants have to say. It's a little too wide and the side stitching does seem poorly done. perhaps the stitching wouldn't have stood out in a darker shade, but in this particular color it is quite prominent. I love the design, but I agree that most of the items on their website are not meant for curvier women. I loved the pants, but I didn't order them because I know pleats are not very flattering for pear shaped bodies like mine :). I just received their dresses (the Kimono wrap and Open front jumpsuit). They are beautiful. The kimono is more forgiving since you can adjust the closure. The jumpsuit not so much, I will have to return it. I really loved their products, just wish it catered more for regular bodies. thanks for the review, but to ensure a more accurate one how tall are you since I am 5 feet, I am trying to figure whether they will look the same way :) or worse.